Pumped up Kicks: Is barefoot running for me? No this blog isn’t about Foster the People, or songs that are good to run to. (I will say though right now I am digging: Young Blood by The Naked and Famous, Sail by Awolnation, Somebody that I Used to Know by Gotye, and Frankenstein by Tokyo Police Club) This blog is my opinion on barefoot running. Today I got a new pair of pumped up kicks! I’m super excited about them. I spend the majority of my day on feet. Being the multi-tasker I am I feel I should be doing something positive for my body while I work. 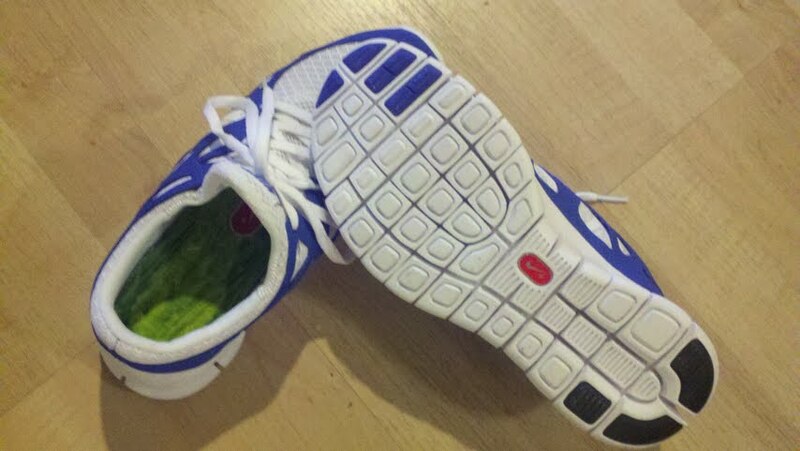 Wearing minimalist shoes while walking, working, cross training, and strength training is great for your body. They make you recruit more muscles in your arches, calves, and glutes to support your bones structure. My new Nike Frees! Thank you Norman! So do I support Barefoot running you might ask? That is a tricky question. I do know it can be done right, I doubt the average person can do it right. I don’t believe women can run long distance long term with a barefoot stride. So what does that all mean? I doubt the average person can do it right because of the patience required to completely rebuild from scratch. No that doesn’t mean starting a training routine barefoot. It means forcing yourself to decrease your mileage and speed slowly building up from less that a mile at a much slower pace very gradually over time. I do know one runner who has done that. (Props to you Adam Depue!) Most runners, however, I don’t think have this patience. If you want to prove me wrong, I will greatly credit your determination and patience! Women on the other hand is another argument. I do not know a runner who have done it. They have all developed an injury at some point. If there is someone out there who is female and has been running consistently injury free I would love to hear about it and chat with you. I do not think this is a common case. Born to run will argue about how our ancestors ran barefoot. Obviously able to not only run, but also provide food by hunting and gathering in minimalist footware. There are some holes I could punch in this argument (arguing life-expectancy for example), but I won’t. I will give them props in saying their argument point to how sedentary we have become as a society. If we were to go back to our ancestors example we would be stronger for it. I do feel we could all be stronger by wearing “barefoot” shoes more often–why I got them for cross training and work! What Born to Run won’t talk about is WHO those hunters and gathers were. They weren’t women. They were men. Those were the tradition barbaric roles. At a more scientific level, it also won’t talk about the Q angle. Women’s hips are wider on average then mens. This is so we can bare children, but it also puts our knees under greater pressure in sport (or hunting and gathering in prehistoric times.) This is also why women are at greater risk for tearing their acl in sports like soccer. Sharp cutting can tear the acl of woman who hasn’t built up her stability muscles much easier than her male counterpart athlete. If a woman doesn’t have proper arch support she will be predispositioned to develop runners knee much quicker than a male would simply by her anatomy. Long story short, barefoot runners beware. I respect those of you who have had the patience to develop the musculature needed to support this. I am weary of those I know aren’t strong enough to do it. I will, however, proudly sport my barefoot shoes anytime I’m not running! Check out good prices for Nike Frees! Great thoughts. And cool shoes. And good music recomendations!